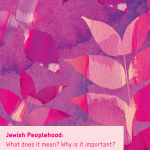 This Reut Institute document deals with the State of Israel’s role as the nation state of the Jewish People in the 21st Century, and the mutual connection between the State of Israel and Diaspora Jewry. This connection has great importance for the future of the State of Israel: First, the relationship between Israel and the Diaspora serves as a central pillar of Israel’s national security. Second, and perhaps more significantly, this connection fundamentally relates to the essence of the State of Israel, its vision, mission, and purpose. PreviousPrevious post:Professional Development Resource for Educators: Join our new seminar series!NextNext post:Jill Blair: Why Are We Still Here?